Gucci Museo and Cafe, Piazza della Signoria, 10. Right, this place more than any other has just about become my home from home on tours. The Gucci Museo opened in 2011 I believe and part of it was the creation of an amazing Cafe on the ground floor. Normally I avoid main squares like the proverbial plague, but in this case, I make an exception. The staff are super friendly, the ambience as you would imagine, very stylish, free wifi (hence this place has become my new Florence ‘office’ whilst on tour), surrounded by books – free to browse – you can sit for hours nursing a coffee or even have a delicious – and not that expensive, lunch. They know their wine too. Wonderful, wonderful addition to the city. Gucci Museo and Cafe. Trattoria La Gratella – Via Guelfa 81/R. Maybe my favourite place so far in Florence. 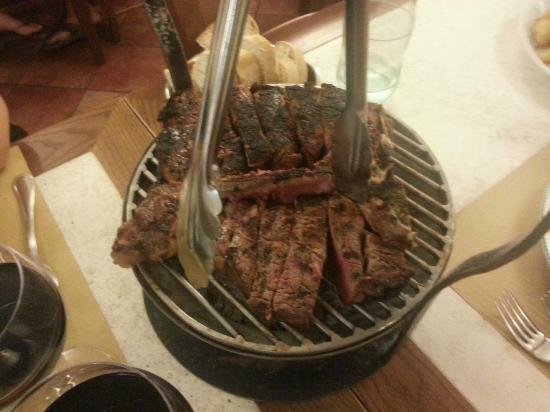 A ‘Gratella’ as far as I can understand, is the word for grill and this is what you really should order here. You’ll be brought a mountain of grilled meats on a grill, kept hot with charcoal below and encouraged to wash it down with great Tuscan reds. Beat The Lines – The Uffizi Galleries and Accademia too. If you don’t have a booking (on-line or otherwise) to visit the famous galleries the queues to get in or even to get a booking for that day can be very long (up to 2 hours). 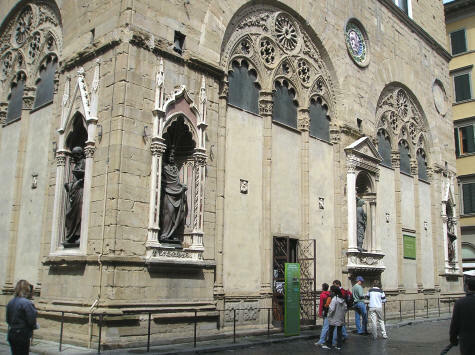 Few people realise that just a couple of blocks away at the Orsanmichele Church the doorway (see picture below) doubles up as a ticket booth. It is often possible to go here where there is never a queue and buy tickets for the Uffizi Galeries at whichever reservation slots they have available on the same day. You simply pay a small reservation fee on top of the ticket price- well worth it to avoid 2 hours of queuing (I know it is just about our National Sport in England, but even so). I believe this trick works also for Accademia tickets/reservations (i.e to see David). I’ll check on my next visit. Watch this space… It does! (Sept 2012) Also, VISIT on a Monday (the only day of the week it is open) see thw amazing three floors of the Orsanmichele Church itself. Well worth it. I agree with Thomas. My husband and I recently completed a Tuscan wine tour with Lisa as our guide. It was a wonderful day. She managed all the details including lunch in a quaint village, a private tour with the winemaker of the most amazing winery, with a short stop at a nearby abbey and the most pleasant and informative conversation. Tuscany is a wonderful place to visit on your own but having a professional like Lisa at your side makes it truly enchanting. I totally agree that Lisa is an incredible guide. I have toured all over the world and Lisa is one of the best guides I have encountered. Her knowledge, how to make things really interesting, her sense of humour and passion for history and people are outstanding. I will look her up Jon my next visit to Tuscany!